A concept for regional development for the districts Konstanz and Sigmaringen within a contest of the Land of Baden Württemberg has been the headstone for the project. The contest “Regional competitiveness by innovation and sustainability” –known as RegioWIN from February 2013. RegioWIN is a contest of the Ministry of Finances and Economy, the Ministry of Rural Affairs and Consumer Protection and the Ministry of Science, Research and Art. Its goal is to improve regional locational factors. InnoCamp was awarded in January 2015 as one of the flagship projects. This was a very important step towards the realization of the project. The goal of the joint project between the Municipality of Sigmaringen, the Economic Promotion of Sigmaringen and the University of Applied Sciences Albstadt-Sigmaringen is to improve innovation of the regional economy, to gain and keep highly qualified staff as well as to increase local attractiveness for companies by developing a unique infrastructure. Due to the focus of the University of Applied Sciences in Sigmaringen, an interdisciplinary approach regarding production-efficiency in energy and resources, sustainable energies and Life Sciences is pursued. Keeping this in mind, mutual projects between local industry and the Model Factory are developed. Start-ups help to strengthen and widen local potentials and competencies. The InnoCamp Sigmaringen is being developed on a total surface of about 8.000 m² in the south-western part of the former Graf-Stauffenberg Kaserne, close to the University. To ensure close connection and exchange of the institutions, a bridge to cross the Hohenzollernstraße will be built. The InnoCamp was awarded as flagship project within the contest RegioWIN of the state of Baden-Württemberg. It is a joint project between the municipality of Sigmaringen (lead partner) and the University of Applied Sciences Albstadt-Sigmaringen (project partner). In total, investments of up to 12 million Euros for this flagship project are available. 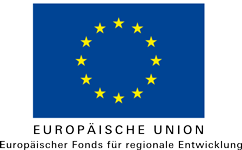 Up to 5 Million EUR are covered by the municipality of Sigmaringen, up to 5 Million EUR is covered by the fund of the EU for regional development (EFRE) and up to 2 Million EUR are covered by the state of Baden-Württemberg.